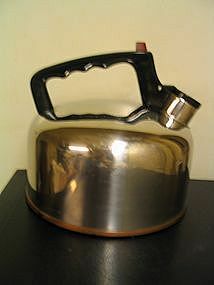 Vintage tea kettle marked Sears Roebuck USA, but I believe it was probably made by Revere with the Sears logo. It is marked 3 quart and 10 75, which I have wondered if is the date. If I am not mistaken, it was bought in the seventies. It does have quite a few superficial scratches from being packed improperly. There is some oxidation of the copper around the bottom rim. The bottom has a few tiny shallow dings. The interior was dry when packed and does not appear to have any damage. As far as I know, this is a USA manufacture. In later years, Revereware was manufactured in Korea and China. Email for more detailed photos. I need your zip code to calculate the postage.